Just last week I wrote about the long-awaited departure of Google+ photos, and with today’s announcement that Google+ and YouTube are now filing for divorce, my theory that Google+ is walking dead continues to strengthen. Yup, you heard right, Google+ and YouTube will no longer be affiliated, which means you can comment, upload or create a channel on YouTube videos without being required to have a Google+ account. Why not? But in all seriousness, with Google no longer requiring new Gmail users to create a Google+ profile since back in September of 2014, later splitting up Google+ into streams and photo products, and finally with last week’s announcement of the death of Google+ photos, it’s clear that Google+ is being slowly phased out. According to the Google blog: “People have told us that accessing all of their Google stuff with one account makes life a whole lot easier. But we’ve also heard that it doesn’t make sense for your Google+ profile to be your identify in all the other Google products you use.” No kidding: That’s because Google+ is on its way out, and everyone seems to know it, including Google themselves. The YouTube team likely also realizes that being integrated with Google+ is not the best option for their viewers. The barriers are too high (since so many people dislike Google+), and with Facebook now driving close to as many, if not more video views then YouTube, the video platform needed to make a beneficial change for its audience. 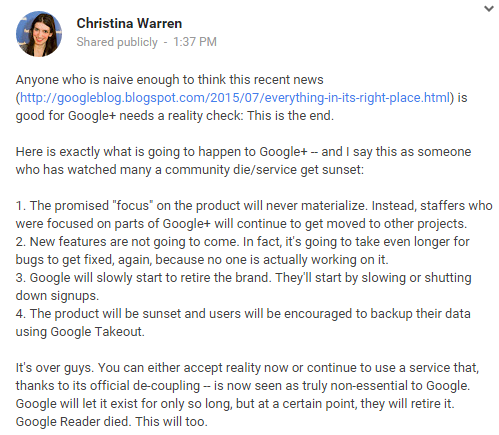 As Google slowly dismantles Google+, Mashable’s Christina Warren predicts that Google is working to retire the brand: “It’s over guys. You can either accept reality now or continue to use a service that, thanks to its official de-coupling – is now seen as truly non-essential to Google,” she says. In YouTube’s blog post explaining the separation, they warn YouTubers not to delete their Google+ accounts all together. “If you want to remove your Google+ profile, you’ll be able to do this in the coming months, but do not do it now or you’ll delete your YouTube channel,” says the post. So be patient, soon enough you’ll be set free, but don’t risk losing your YourTube channel. 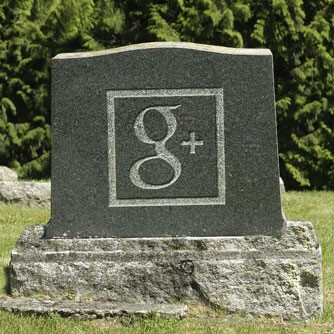 Even though Google hasn’t confirmed that Google+ is going away, I’m 100% confident that it’s coming to its final days. Get ready to kiss the social network goodbye.